“We must build dikes of courage to hold back the flood of fear.” -Martin Luther King Jr. In 2012, Joshua took a job at Emerald Cove Catering. The nineteen year old had no culinary experience prior to that position. The camaraderie of the kitchen quickly consumed Joshua as he dove head first into the industry. After a few short months of being a steward, his hard work and dedication landed him a promotion to the prep team and that was where the obsession really began. Joshua was fascinated by the history and the strong attention to detail of classic French cuisine. In the fall of 2013, Joshua joined the Apprenticeship program and began to work and learn in high-volume catering, quickly rising to the top at Emerald Cove Catering. In February 2015, Joshua had the opportunity to go work in another high-volume production kitchen at Centerplate at Safeco Field. With that decision, he had to put the Apprenticeship on hold. While at Centerplate Safeco Field, Joshua was the lead cook for The All-Star Club in the Suite Level Kitchen. He was also appointed to providing food for the Players of the Seattle Mariners before the game. Whilst working with new Chefs, Joshua took the opportunity to learn as much as he could from them as they progressed through the baseball season. 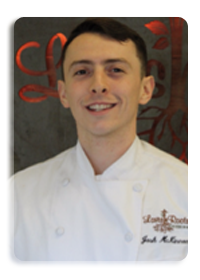 Near the end of the 2015 season Joshua was offered a Lead Cook position with award winning Lavish Roots Catering. This opportunity to work under ACF certified chefs was a catapult towards the next chapter. In February 2016, Joshua competed in the Jeune Commis Competition through the Chaine des Rotisseurs in which he took First Place. And in May, Joshua also competed in the World Chef Sanctioned ACF Culinary Salon at Bellingham Technical College where he earned a gold medal in his category. That following autumn, Joshua reenrolled into the Culinary Apprenticeship through the ACF. Despite the hiatus, his goals and dedication were unchanged. Joshua sees the Apprenticeship and the ACF as a lifelong commitment to the continuous strive to be better. Once he obtains his Certified Sous Chef Certification, Joshua will immediately begin to train for his CCC (Certified Chef de Cuisine) and a nutritional certification. In medium sauce pot, reduce Veloute by one third. Trim and Brunoise red bell pepper. Fold in bell pepper, garlic, tomato paste into Veloute once reduced. Fold in parsley right before plating. Visit the MEMBER SPOTLIGHT ARCHIVE page to view past Spotlighted members.